Unfortunately, departures and arrivals are thoroughly separated in T2E, so you won't be able to access any of the 2E peers if your connection departs from 2G. You can access the arrivals lounge (if you fly in Business Class or if Flying Blue Gold or Platinum) located in the terminal 2C if you don't mind to go landside. you can't stay in 2E. The only alternative if you don't want to go to 2G immediately is to go landside, as if you were ending your trip in Paris, and do whatever you want (including the arrival lounge in 2C). - Access reserved for HOP! Air France SkyTeam Elite Plus (Flying Blue Platinum, Flying Blue Gold) customers and La Première and Business customers with a connection at Paris-Charles de Gaulle. I've seen that, in some cases, it's possible to get from one concourse of the 2E terminal to another (for example from L to M with the bus, and then back with the same bus - not sure if it's possible to get out at another terminal). Has anyone tried to do this in order to get to a "better" AF lounge ? For example, for going to the M lounge instead of the vastly inferior L lounge ? For example, for going to the M lounge instead of the vastly inferior L lounge ? It never hurts to ask a transfer desk, but personally, I would not endure the hassle of a double security check just for hot food. My impression was, though, that the bus line that tours the non-schengen terminals does not require one to go through security again - so that specific point wouldn't be an issue. No, it's not possible to go to a concourse where you're not departing from. This was allowed exceptionally last year when K lounge was closed for renovation. The atmosphere is really nice IMO : great furniture, colors, fabrics. The fact that the lounge was quite crowded (Thursday evening, during Vinexpo) did not encourage to take pictures. Is it possible to get from 2E to T1 airside? Any recent experiences [using Shuttle]? Reason I am asking is that I've dropped from FB G to FB S, so don't have lounge access anymore. 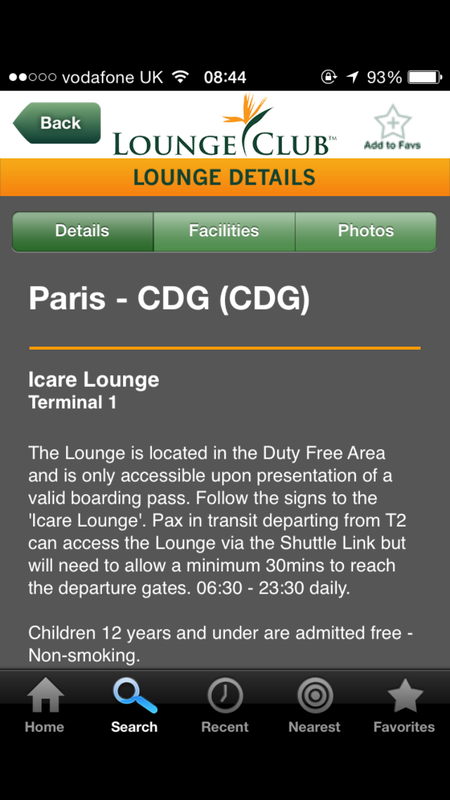 However, I do have Lounge Club membership and they have a lounge at CDG T1, but I am flying back to LHR from 2E. On the outbound, they have lounge at LHR T4, which makes it easy.